Do yourself a favor and resolve to start 2009 without a wicked headache from drinking too much cheap Champagne. Today’s Seattle P-I has a good primer on sparkling wines, which includes tips on matching bubbly with food and a shopping list with bottles ranging from $9-$35. The classic example of sparking wine is, of course, French Champagne, but there’s also Spanish cava, Italian prosecco and many fine domestic sparkling wines including one from New Mexico(!) Click here to learn more. And from eHow, here’s seven easy steps to opening a bottle of Champagne. But this mistake is nothing compared to this completely NON-age appropriate cake for “Lil Derrick” that I saw on Cake Wrecks. This is for a 4-year-old! Did they play pimp slap the donkey at this party? My friend Thao didn’t go to the ends of the earth for love. She just went to Switzerland. Her husband, Matthias, is Swiss and they live in Geneva, which is a long way from Seatle. I miss her terribly and was excited when Thao told me she, Matthias and Matthias’s parents, Helen and Hugo, were coming to Washington for Thanksgiving. A couple days after turkey day, my husband and I had lunch with Thao, Matthias, Hugo and Helen to help polish off some leftovers. There was turkey, prime rib, mashed potatoes, salad, pumpkin pie, and one thing that made me do a double take–one Bartles & Jaymes strawberry margarita wine cooler. I asked Thao about it, and she said nonchalantly, “Oh, my mom gave it to me with the rest of the leftovers.” I found this stranger still. I ask Matthias if there was a Swiss equivalent to the American wine cooler, and although I’m sure one exists (since most countries have some kind of cheap alcohol), none came to his mind. I thought that I had conveyed that wine coolers weren’t really anyone’s drink of choice so I was surprised when Hugo said he wanted to sample some. I got to thinking about those Bartles & Jaymes commercials in the ’80s that featured two old guys and always ended with “Thank you for your support.” Here’s a funny one. Equally baffling is McDonald’s McRib sandwich. I had never tried a McRib before, but after seeing a billboard declaring, “The McRib is back,” my interest was piqued. My husband has sampled many a McRib and said the sandwich was good. He was excited I wanted to try one since I rarely eat junk like the McRib. 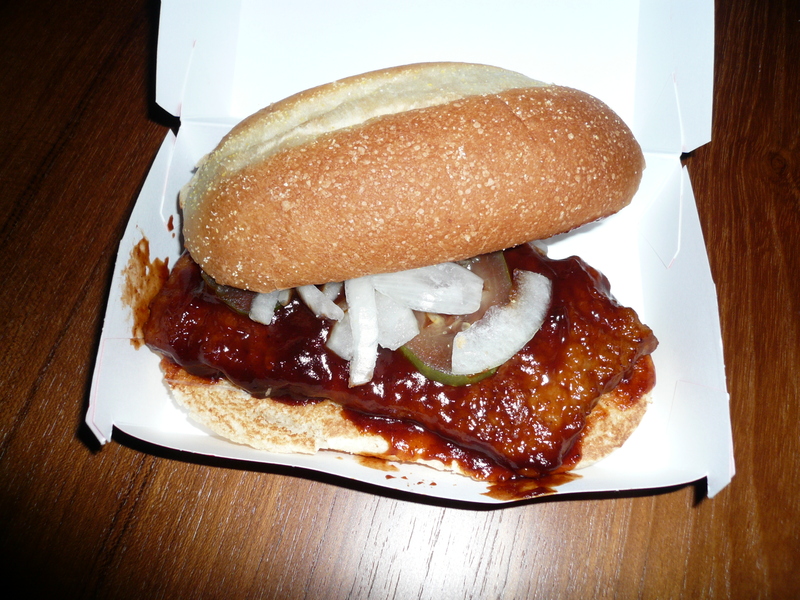 The McRib is a boneless pork patty that is covered in barbecue sauce and served with pickles and onions on a roll. Its standout feature is that the patty is pressed so that is resembles a side of ribs. This is truly weird. The only thing that may be stranger than the McRib’s boneless ribs is its promotional Web site. A “McRib DJ” thanks users for visiting the site and declares that “Saucy love is back.” He then directs you to get free McRib downloads and listen to one of four McRib radio stations. The free ringtones are pretty funny–they’re heavy metal odes to the McRib, but how is this supposed to get people to buy more sandwiches? I feel like this ad agency got caught up in creating a slick Web site and new technologies instead of focusing on the basics of selling. Here’s a YouTube video featuring “The Simpsons” version of the McRib–the Ribwich. Although it’s in German(! ), it’s still funny. This Wikipedia entry gives a full synopsis of the episode. As far as taste goes, I was surprised to find that the McRib isn’t terrible. The barbecue sauce helped a lot, and the pickles and onion added some extra flavor. You could do a lot worse when it comes to fast food.